While the thin barrier peninsula that would later become the City of Miami Beach was discovered long before Carl Fisher arrived in South Florida, Fisher’s personal discovery of the peninsula was courtesy of serendipity and then the formation of an unlikely partnership. Without Fisher’s involvement, it was inevitable that Miami Beach would have become a city and may have evolved in a similar manner. However, the founding of the City of Miami Beach benefitted greatly from Fisher’s means and talents. The city would not have been built as quickly and gotten as much notoriety without Fisher. Fisher’s involvement in the creation and evolution of Miami Beach cannot be overstated. His imprint on Miami Beach was a culmination of life experiences that began at a very early time in his life. Carl Fisher was born on January 12th, 1874 in Greensburg, Indiana. He was the second son of Albert H. Fisher and Ida Graham Fisher. Carl’s parents separated when Carl was a young boy. His father was an alcoholic and provided very little support for the family during Carl’s childhood. Carl’s mother moved the family to Indianapolis, where she took in boarders to make money to support herself and her three sons. Due to severe astigmatism, providing him with only 50% of his vision, Carl dropped out of school in the sixth grade. He was unable to see the blackboard and wasn’t able to keep up with the rest of the class. In addition, he felt that he needed to help is mother support the family. Dropping out of school led Fisher to become a lifelong entrepreneur. One of his first jobs was peddling papers, books, tobacco, candy as well as other items to passengers at a railway stop in Indianapolis. One of his techniques to break the ice was to wear an apron that he could flip to show a completely naked woman. Once he got the attention of his prospective customer, he would convince them to buy something. He learned that he had a natural gift for sales. It is while he worked for the railroad that Carl would begin his lifelong appetite for reading and learning. Despite his vision troubles, he developed a passion for the Robert Ingersoll books that he sold to passengers. When he built his house on Brickell Avenue in Miami, Fisher had twelve volumes of Ingersoll’s books bound in maroon linen stamped with gold to add to his library. Fisher would leave the railroad and worked at a bookstore and then a bank for a short while. He was able to save enough money to open a bicycle repair shop with his brothers. It was 1891 and Carl was 17 years old. The bicycle craze was in full bloom and Carl understood the opportunity. Carl became one of the first members of the Zig-Zag Cycling Club. It was his membership in this club that he met Jim Allison, a friend and a future business partner in a variety of enterprises that would help Carl make his fortune. At the age of 19, Carl began racing bicycles professionally. Carl was a natural athlete that could out race his friends running backwards while they ran straight ahead. At the same time, his bicycle shop was a big success. It led Carl to convince a bicycle manufacturer, Erland of Cleveland, to provide him with $50,000 of bicycle inventory on credit. With very little money to promote his business, Fisher employed a number of promotional stunts to sell bicycles. 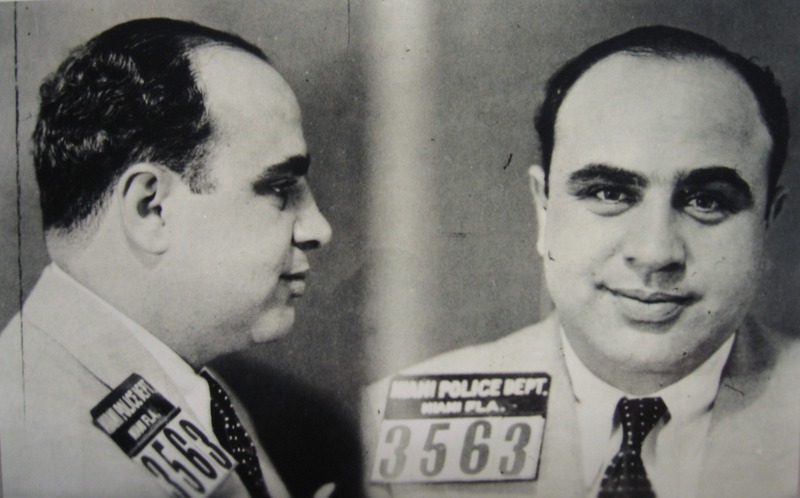 He would ride a bicycle over a tight rope twelve stories above ground between buildings, throw a bicycle off an Indianapolis building, and gave away prizes to induce the sale of bicycles. The lessons he learned about promotion would become a Carl Fisher hallmark throughout all of his business ventures. At the onset of the twentieth century, the automobile was all the rage. It led Fisher to add a small garage at the back of the bicycle shop which later led to the formation of the Fisher Automobile Company. Carl developed an interest in automobile racing and quickly saw a new opportunity. Carl Fisher’s big opportunity in the automobile industry wasn’t in assembling or selling automobiles, but was to provide light so that automobiles can be driven at night. In the early 1900s, automobiles were lit with dim kerosene carriage lamps. If there were a strong wind, the lamps would blow out and the light would disappear. Carl understood the problem and found a solution. In 1904, the owner of a patent for compressed acetylene used in buoys and lighthouses, Fred Avery, got Fisher interested in the idea of using this gas for headlamps. Fisher and Jim Allison bought a half interest in Avery’s company that manufactured and supplied acetylene for headlamps. Later, Fisher and Allison would buy Avery out of the business and rename the company to Prest-O-Light Corporation of America. 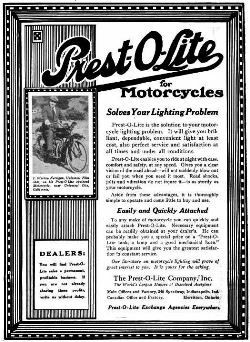 By 1910, the Prest-O-Light company was such a success that Union Carbide offered $9 million for it. The partners accepted the offer in the form of Union Carbide stock. 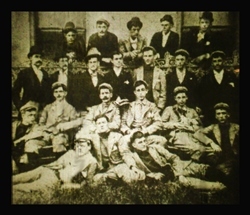 The sale of the company was finalized in 1911. Carl Fisher’s share of the sale was $5,633,556. His portion would be worth close to $141 million in present day dollars. 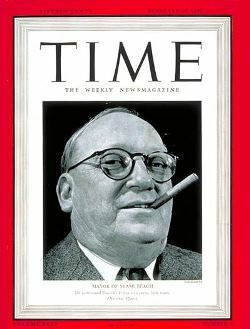 Fisher would later leverage his Union Carbide stock to invest in a number of ventures including the development of Miami Beach. In addition to the aforementioned companies, Carl Fisher was also the founder or a major catalyst for the development of a number of other American institutions from 1905 through 1930. The Indianapolis 500, Lincoln Highway, Dixie Highway and Montauk Point are all examples of Carl Fisher’s investment and work. His investment in Miami Beach is what South Florida will remember him best. Even prior to the sale of Prest-O-Lite to Union Carbide, Fisher and Allison were doing well financially. 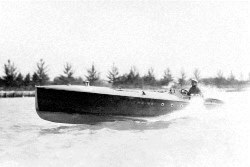 In 1909, Carl ordered a forty-five foot yacht to cruise Lake Michigan. The name of the yacht was Eph, after his favorite dog. The yacht was ready in November of 1909, but Carl didn’t want to wait until the summer to try her out. He got the idea to sale the yacht down the Mississippi River to Florida. He invited a friend, Harry Bushman, to join him on this expedition. Upon delivery of the yacht, and on impulse, Carl also invited the gentleman that delivered the Yacht. His name was John H. Levi and he would become a very good friend of Carl Fisher. 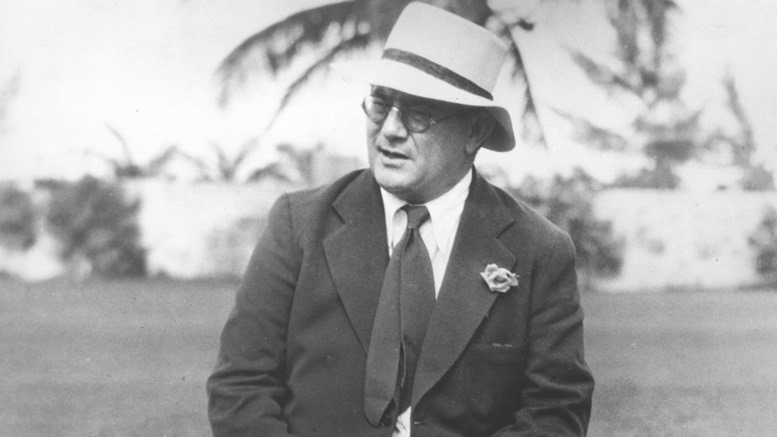 Levi would also later become one of the founders of Miami Beach and a two time mayor of the city from 1937 to 1941. However, Jane Fisher thought the yacht was a wedding gift and announced that she was joining the men on the trip. Carl married 15-year old Jane on October 23rd, 1909 in Indianapolis, Indiana. Carl was expecting a boy’s trip and had no idea of taking a woman on a boat trip. He felt that she would spoil the fun. However, after persistence by Jane, Carl agreed to let her tag along. Joining the party was William Galloway, Carl’s faithful houseman. The party departed Cairo, Illinois and arrived in New Orleans in time to celebrate Christmas. On Christmas Eve, the others left Jane and William Galloway on the Yacht to trim a little tree while they explored the town. The men ended up spending the entire night in the pleasure palaces of New Orleans and didn’t arrive home until the early morning of Christmas. They arrived with a roast pig as a peace offering for Jane. After Eph departed New Orleans, it got caught in a storm in the Gulf of Mexico headed toward Florida and blew them into a deserted beach in Mobile Bay. The storm ended the trip. Carl and Jane Fisher decided to go onto Jacksonville, Florida and left the boat in the capable hands of John Levi. The plan was for him to bring the boat to Jacksonville. Levi was able to get the yacht fixed and ended up sailing the boat until he reached Biscayne Bay. He sent Carl a wire that read: Arrived safely. Miami pretty little town. Why not meet me here instead of Jacksonville? Carl and Jane Fisher came to Miami by train in February of 1910. Although the Fishers only stayed one week during this trip, Carl enjoyed the water of Biscayne Bay and loved the weather. He vowed to come back. Carl and Jane Fisher came back to Miami every winter following their first visit to the Magic City. They bought a home that resided at the corner of Brickell Avenue and South East Thirteenth Street. The 1913 city directory simply lists the Fisher home at “Brickell av opp 25th”. The street names would change in 1920 and 25th street would be renamed South East Thirteenth Street. The home was still standing into the late 1960s. 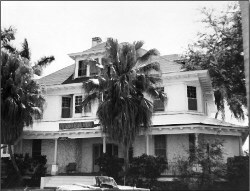 The Conrad Hotel now sits at the former location of the Fisher home. Carl bought the house sight unseen. He would name the home the Shadows due to the shade provided by the Australian Pines that were located on the property. Jane was the first to come up with the name in referencing the Brickell home, but Carl became so fond of the name that he would later use it to name is home on Miami Beach and all of his later yachts. Jane enjoyed the winter social scene in Miami. She would dress up and attend parties, luncheons, teas and tennis with the winter crowd at the Royal Palm and Halcyon hotels. Carl enjoyed all the fishing and boating he wanted. One winter, Carl got frustrated with the aggregation of trash that collected around his dock. He addressed this issue by hiring a dredge to scoop up land around the dock. The dredge job proved to be inexpensive and provided Carl with a valuable technique that he would later use in developing Miami Beach. After selling Prest-O-Lite to Union Carbide, Carl Fisher was 37 years old and was left to figure out what to do next. While in Miami, he enjoyed taking his boat around Biscayne Bay. On one occasion, while exploring the bay with his wife Jane and John Levi, he took his dinghy into Indian Creek on the largely abandoned peninsula across the way from Miami. As the Fisher party got deeper into the creek, they became lost. As they approached a clearing, they noticed a very well dressed elderly man. This gentleman was a short man with a white beard. He was wearing a blue suit with a white shirt and a polk-a-dot blue and white tie. Jane found his attire both impressive and a little out of sorts for the location he was working. Carl asked the man how he could get back out to Biscayne Bay. The man explained that if he kept going the way he was going, he would end up in the Atlantic Ocean. He explained that they needed to back track the way they came to get back to the bay. Carl thanked him, but they did not exchange names. The man that provided directions was John Collins, the person who would later provide Carl an opportunity to take on his next project, the building of Miami Beach. The next blog post on Miami-History.com will focus on the partnership that developed between Carl Fisher and John Collins. Their next meeting and subsequent partnership would arguably be the most important event that led to Miami Beach becoming the World’s Winter Playground.